Multi-colored Tiger's Eye with a sleek look. 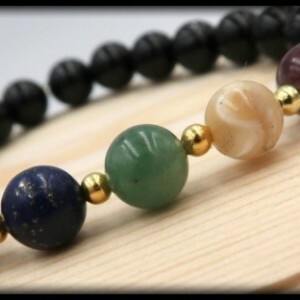 Multi-colored Tiger's Eye helps balance emotional energy and alleviates depression. A great stone when it comes down to reducing your fears and anxieties of whatever may be holding you back. The Lava Rock cleanses your aura of negative energy, aids with anger management, and increases your sexual drive. Lava Rock has the ability to be used as a diffuser with essential oils. 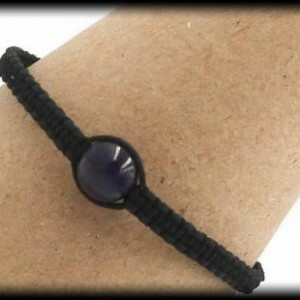 Simply add a drop of your favorite essential oil in one or more of the lava beads on the bracelet. Adding support in clearing and activating the Root Chakra is Hematite. It provides a feeling of stability, dissolves negative energy, boost self-esteem, and stimulates focus/ concentration. Add this sleek eye-candy to your wrist for any occasion and reap its benefits. This gem is designed with 8mm beads of Multi- Color Tiger's Eye, Lava Rock, and Hematite. SIZING INFORMATION Please measure your wrist with a measuring tape to ensure the most accurate measurement. If you do not have a measuring tape, you can also use a string by wrapping it around your wrist and then cutting the piece of string. After you have your cut string, place it alongside a ruler and write down your measurement. To ensure a perfect fit, please had 0.5 inch to your wrist measurement, if you want a little room please add .75 inches to your wrist measurement..